Any time you undertake paid work for someone else you must make sure that you are protected by a contract of employment. Though an agreement and therefore a contract may technically exist from the moment you and your employer speak about the terms of your employment, the law can provide you much more protection if you can produce a written document. Before you begin working, make sure you have a signed contract in your human resources folder, or at the very least observe the minimum requirement that you receive written notification of your terms of employment within two months of starting your job. 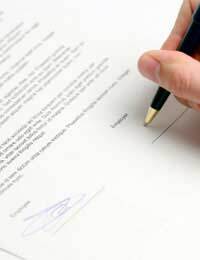 A contract of employment is a verbal or written agreement between an employer and an employee. When you are employed by someone else you automatically gain certain rights, such as the right to be paid the legal minimum wage and the right to paid holidays and sick days as per the law. Written contracts also spell out further rights and responsibilities held by both the employer and the employee. Remember, contracts of employment are legal documents and therefore if an employer does not offer a contract along with an employment offer you should proceed with caution – and question the legality of the position. What Terms Are Usually Contained in a Contract? A statement of the agreed upon salary or hourly wage, including overtime pay. Expected hours or schedule of work, including overtime, which should never exceed the national maximum. Holiday and sick pay, which should conform to national legal guidelines. Directions on who the employee reports to and takes direction from regarding work matters. A statement and description of an observation or probation period. The notice period expected of the employee, or how many months/weeks/days the employee must give their employer before leaving their position. A date for the employee’s start of employment. Areas for both the employer and employee to sign and date their signatures. Contracts of employment may seem stuffy, unnecessary or even frightening, but their main purpose is to protect. Contracts protect both the employer and the employee by spelling out their rights and responsibilities so that everyone involved is on the same page and has the same expectations. While it is possible that one party may break a contract of employment, the weight of the legal system (and the threat of a lawsuit) makes this ill advised. If you do find yourself in a position in which the terms of your contract have been broken, seek advice from your human resources department and consult a solicitor if necessary. However, a legal entanglement may be long, costly and cause your working reputation to suffer so be sure that this is what you really want before starting down this road. Avoid such an ugly situation by insisting on a clear and thorough contract of employment from the outset.